A drought plus high temperatures, dry fuels and winds helped feed wildfires burning in the west. NBC's Miguel Almaguer reports. Near historic droughts have led to dozens of wildfire breakouts in Western states, leaving firefighters struggling to battle flames threatening homes and inching closer to populated areas from Alaska down to Arizona. The National Weather Service warned early Friday that gusting winds and “very low” humidity in parts of hard-hit Idaho - already dealing with nine large fires - meant there was a risk of that more wildfires could break out. Warnings that new wildfires could break out were also in place for parts of Utah, Montana and Hawaii. The Elk Complex Fire in the southern Idaho mountains has burned more than 111,000 acres, destroyed 38 homes and 43 other structures. Evacuation orders have cleared out the town of Pine, a popular vacation area where most of the destroyed homes were located. The Forest Service said in a notice Thursday said the fire was not expected to be fully contained until Oct. 1. Fire officials also continued to struggle with the “Rockport 5” wildfire near Park City, Utah, which has destroyed 8 homes and spans nearly 2,000 acres. In all, 34 major fires are burning across 11 states, fueled largely by severe drought conditions. The Patch Springs fire burns at the south end of the Stansbury Mountains, near Tooele, Utah, on Aug. 12. “You get a hot spring and certainly a hot early summer you had, and you’ll get an expanding drought. And that’s exactly what’s happened out West,” said The Weather Channel’s Jim Cantore. With rainfall below average for a second year, the past seven months have been the driest on record in the areas where wildfires have consumed more than 700,000 acres. The fire center said 3,119,259 acres had been burned by fire from the start of the year to Thursday, compared to 6,475,066 acres over the same period last year. Though it has not been a record setting year for the amount of wildfires, it has been a noteworthy one. In June, 19 firefighters were killed while attempting to contain a fire in Yarnell, Ariz. In July, 486 homes were destroyed in Colorado’s Black Forest Fire, the most destructive ever in state history. The Forest Service issued a map showing the location of the wildfires throughout the country Thursday. Apart from Idaho, California and Oregon were both dealing with five large wildfires. Utah had four, Alaska three, with Washington and Montana both on two. Arizona, Colorado, Nevada and Wyoming each had one. Still, firefighters continue to slowly make progress. The National Interagency Fire Center said Thursday that five large fires in Oregon, Washington and Montana had been contained. Working late into the night, authorities in Utah were able to contain 50 percent of the Rockport blaze — although unpredictable wind gusts means future progress will rely on Mother Nature. 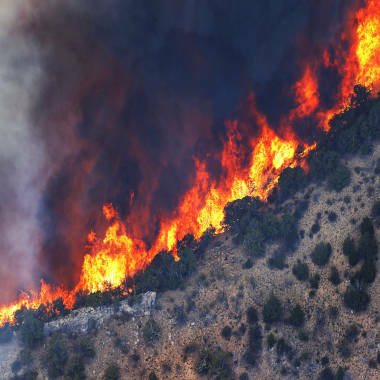 “We've seen extreme fire spread and extreme fire behavior with rapid changes in direction,” Bryce Boyer of the Utah Division of Forestry told NBC News.